VertaseFLI removed radium contamination from a number of hotspots on a former RAF base in North Wales, part of which encompassed a Site of Special Scientific Interest. Prior to work in the hotspot areas, long grass and undergrowth were examined by an Ecologist for the presence of Great Crested Newts. Once the area had been shown to be clear, the working area was cut back and strimmed. The working areas were then checked over for services by an in-house qualified operative with a Cable Avoidance Tool. The hotspot point source was determined by a Radiological Engineer. Careful, selective excavation revealed several radium painted items. 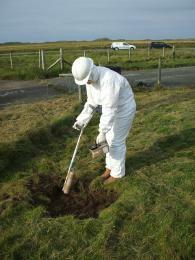 This selective excavation minimized the volume of waste described as Low Level Radioactive Waste. Waste minimisation, a key component in sustainability, was paid due regard at all times. General excavation of the lower radiological areas was also carefully undertaken to ensure that waste that had to be described as Exempt from the radiological regulations was minimised. Low Level Radioactive Waste was contained in a suitable drum, prior to disposal at Drigg, and exempt material in a high sided skip prior to removal from site. Both materials were accompanied by the statutory paperwork and were compliant with all relevant legislative and health and safety aspects. 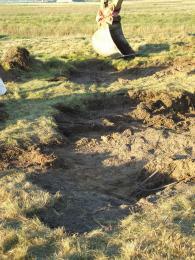 The site was re-instated to the satisfaction of the Consultant Ecologist.